Does the Chartres Labyrinth hide a Troy Town and if so, what does it look like? Is there a relationship between the 11-circuit Chartres labyrinth and the mostly 11-circuit Troy Towns in Scandinavia? What for relations, resemblances or differences exist there? The Chartres labyrinth was built about 1200 in the cathedral of Chartres. The Troy Towns presumably came up between the 13th and 15th century, maybe there are even prehistoric examples. Most have 11 circuits; however, there are also some with 7 or 15 circuits. 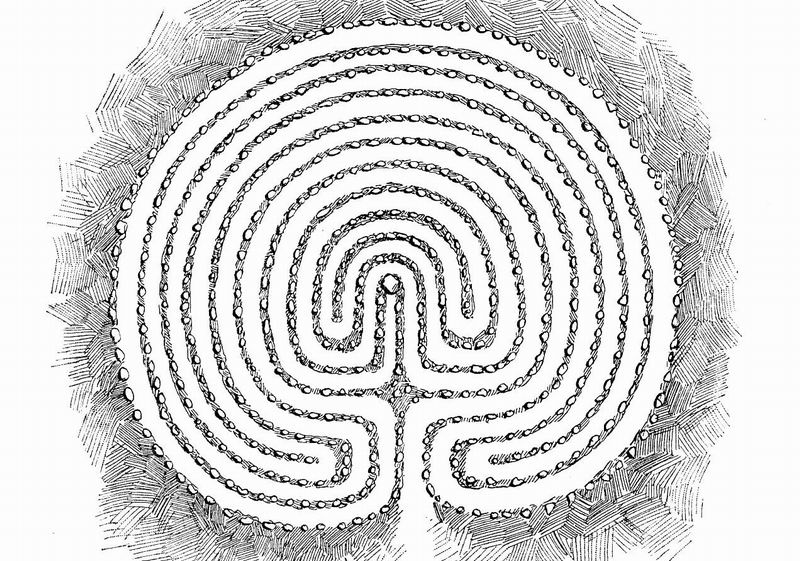 The Troy Towns are related to the Turf mazes (better: turf labyrinths). Most of the still preserved British turf labyrinths are from the type Chartres with 11 circuits, only two are classical ones with 7, respectively 15 circuits. Two German historical turf labyrinths have 11 circuits and are from the classical type. The type Chartres can hardly ever be found among the Scandinavian Troy Towns. Can one compare both nevertheless very different types generally with each other? In addition one must transform both a little. Chartres has some special qualities that distinguish it from the other medieval types to which it belongs. These are the six circular elements in the centre, and the circumference with the 113 lunations. Typically for the medieval types are the “barriers” in the pathways to force a U-turn. In the Chartres type they are arranged along the horizontal and the vertical axis. 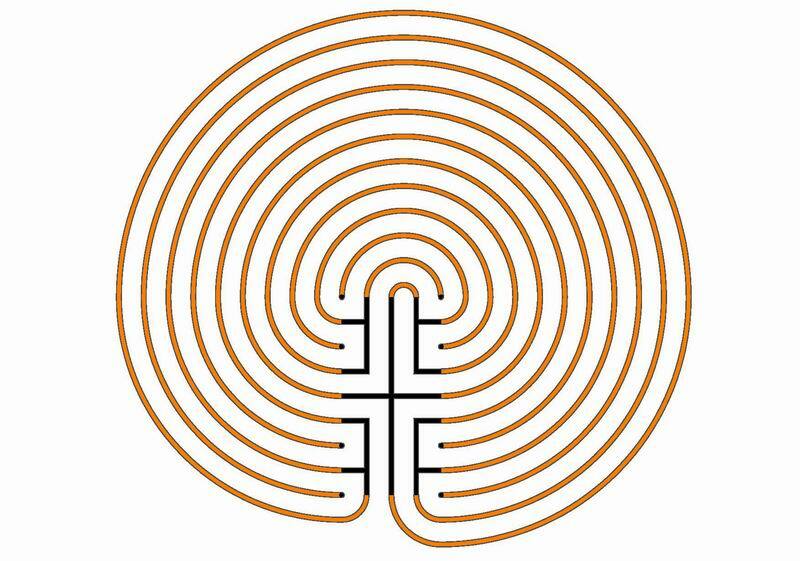 We can save the speculations whether this means the crucifixion or Christianisation of the labyrinth. This can be, but it doesn’t to. Because the axes could be also arranged in other angles or it could exist more axes and, nevertheless, it would produce the same path sequence. The 11 circuits are not an invention for the Chartres type, because the basic pattern of the classical 7-circuit labyrinth generates easily 11 circuits as the Troy Towns prove. 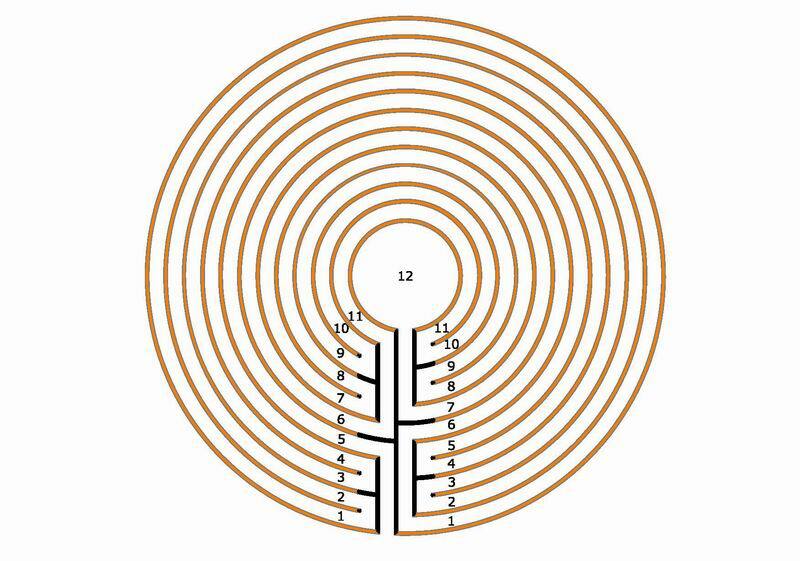 Especially typically for all labyrinth types is the alignment of the circuits that is revealed in the path sequence: this is the order in which the single circuits are walked successively. It determines the quality of a labyrinth. For this shows the rhythm or the melody, or even the dramaturgy of the path guidance of a labyrinth. Can we leave out the barriers and do we than still have a labyrinth? Or differently expressed: Can we make from a labyrinth with four axes one with only one? Yes, it is possible in the type Chartres. This doesn’t succeed with every medieval labyrinth (e.g., with the type Reims, Sens, Bayeux, Auxerre). This already points to the high quality of the Chartres type. The following graphic makes it clear. 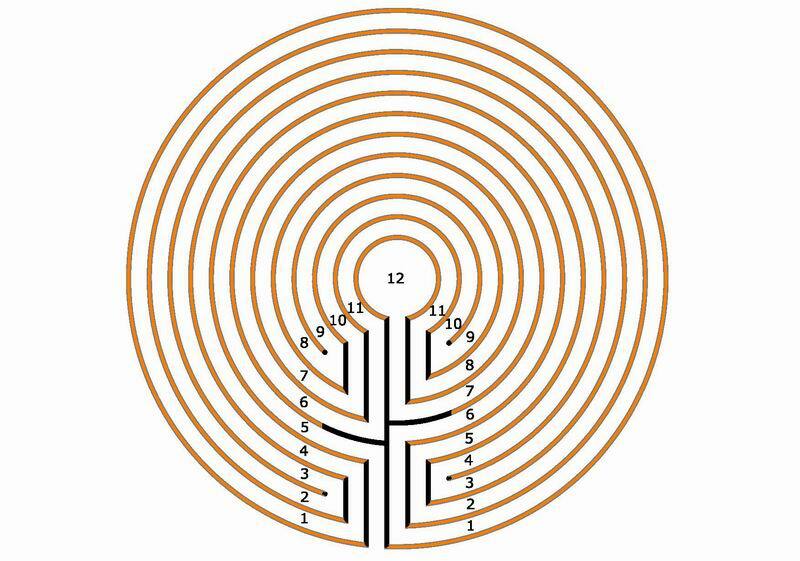 Simultaneously the seed pattern for the walls contained in the labyrinth is marked with black lines. So we can compare the Chartres labyrinth with the Troy Town. To make the Troy Town comparable with Chartres, it has been transformed into a circular form. In the graphic of the Troy Town the seed pattern contained in it is also emphasised in black. The transformation doesn’t change the path sequence. As well as it makes no difference whether the labyrinth is right- or left-handed or whether it is circular or angular, briefly: which form it has. The comparison shows that in both types the first turn to left arises in lane 5. Chartres continues with 4-3-2, the Troy Town with 2-3-4, so in reverse order. Than the order is 1-6-11 in both types. 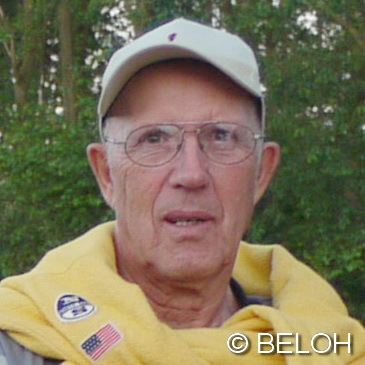 Than Chartres 10-9-8, the Troy Town 8-9-10, so again reverse. At the end both types turn into the middle from lane 7. Some passages are identical, at two places the order is alternated. By now a certain resemblance is to be found between both types. Now we develop from the seed pattern in the Chartres type (without barriers) a classical 11-circuit labyrinth (just a Troy Town) in usual manner. The seed pattern is brought into an angular form and the right parts are lowered down a pathways width. Now it is not quadratic as we are habituated, but rectangular (twice as high as broad), and the central cross emerges. We transformed the circular model with a large centre into a round model with a small centre. To my knowledge such a labyrinth never turned up so far. Whether the master builders at that time knew about these correlations between the Troy Towns and the Chartres labyrinth, I do not know. I rather believe they did not. It is remarkable that the Chartres type apparently not influenced the Scandinavian Troy Towns, surely the British turf labyrinths. For me is clear, nevertheless: There is a bigger relationship between the classical labyrinths and the medieval types than some up to now have accepted. And it shows the extraordinary quality and originality of the Chartres of type. At once it documents that the medieval types were “generated” after other points of view and methods than with a seed pattern. I find substantially the introduction of the “barriers” to attain more U-turns and segments with the same number of circuits in a labyrinth. Or differently expressed: To change the path sequence. It would be interesting to find out; when for the first time the barriers appeared in the labyrinth. Since they are crucial for the advancement of the classical labyrinths, and are decisive for the origin of the medieval types. How does the Troy Town look like developed from the Otfrid labyrinth? How to make a Knidos Labyrinth? How to build a Troy Town? 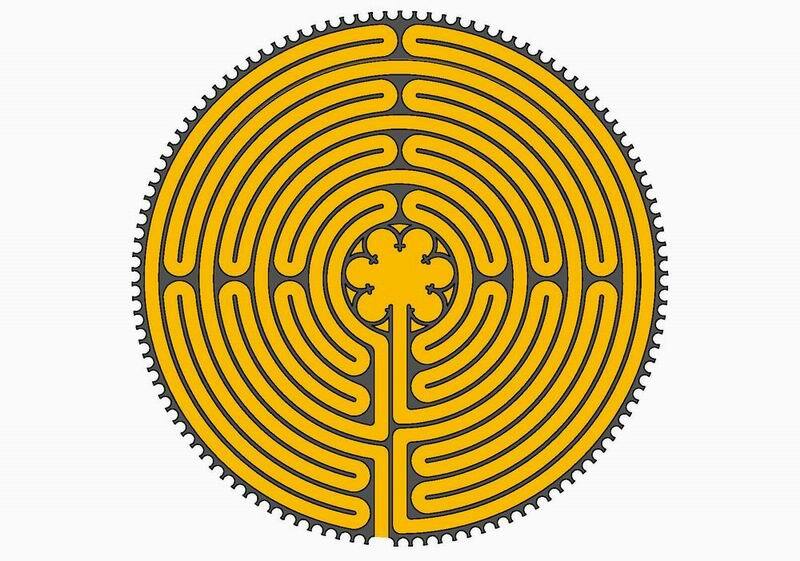 How many Lunations has the Chartres Labyrinth?